Sometimes I get commissions based on a grand idea... while some are just for fun. This is one of those that me and Airu are kinda doing on and off for fun. It really helps cheer up the mood. He also probably has a bit of ADHD... once he gets distracted and attached to an idea he will stick to it until something else nabs his attention. 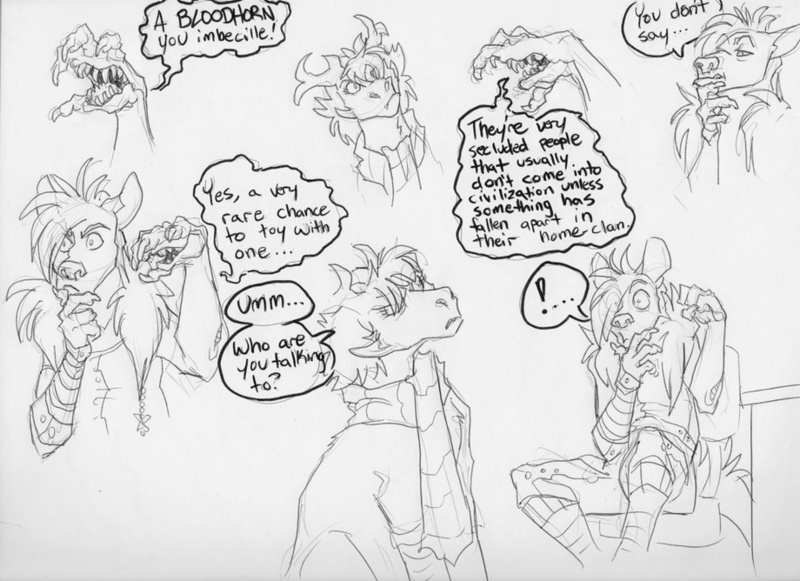 The Bloodhorn is a female named Garnet and also one of Steak's few good friends (albeit this is when they first meet.) :B while others might write off Steak as being a playful mischievous guy she sees his actions are more just the actions of one that seeks to be the center of attention. She isn't immune to his hypnotic ability but one of the few that seems aware that when something feels 'off' that Steak probably had something to do with it. She lives away from her clan in a small town, doing part-time work as a chef at a small local restaurant. How she cooks no one really knows and any attempts to ask her tend to end with her mentioning that "A good chef has their secrets." Doodle for me by Airu~ More to be posted later.